Welcome to our ultimate guide for collecting every Power Moon from the Metro Kingdom in Super Mario Odyssey! Below, you'll find maps detailing the exact location for all 81 of the Power Moons located in this Kingdom, as well as descriptions on how to get each and every one of them. 1. New Donk City’s Pest Problem: You'll automatically receive this Power Moon when you defeat the Mechawiggler boss. 2. Drummer on Board! : You'll find the drummer sitting just to the right of Mayor Pauline after she gives you the task to find musicians. Talk to him to receive a Power Moon. 3. Guitarist on Board! : The guitarist is standing in the northeastern corner of the small park near the Main Street Entrance checkpoint flag (you can find him at location 3 on our map). 4. Bassist on Board! : Head to the park in the very northeastern corner of the map by using an electrical wire from the mainland. Talk to the bassist there to recruit him and secure another Power Moon. 5. Trumpeter on Board! : The trumpeter has plonked himself on the roof of the building at location number 5 on our map. Use poles that are sticking out from the buildings nearby to fling yourself up onto the roofs above, eventually finding your way up to location detailed on our map. Talk to the trumpeter to get the final musician Power Moon. 6. Powering Up the Station: As part of the story, you'll find yourself working your way through the Power Station. At the end, use Cappy to clear the sludge in front of the two giant Piranha Plants and then defeat them both to receive a Power Moon. 7. A Traditional Festival! : Another Moon acquired from completing plot points - simply make your way through the 2D section that appears after you've turned the city's power back on to receive this Power Moon. 8. Inside an Iron Girder: At location number 8 on our map you'll find a Power Moon sitting inside an iron girder. At the start of this girder (on the mainland) you'll find some crates that can be smashed. Break these to find an entrance for Mario to slip inside the girder and collect the Moon. 9. Swaying in the Breeze: Starting at the Heliport checkpoint flag, jump up onto the nearby girder until you're halfway across, then jump up on the next girder to your right and you'll see a Power Moon floating above a third girder swaying in the wind. 10. Girder Sandwich: At location number 10 on our map you'll find some girders that rise into the air with a section that allows Mario to wall-jump right to the top. The easiest way to access this is from the road just north of it (east of Major Pauline). Make your way to the top of the wall-jump section and then up onto the girder above to grab a Power Moon. 11. Glittering Above the Pool: This Power Moon is hovering above the pool on the roof of the building at location number 11 on our map. One easy way to reach it is to warp to the New Donk City Hall Rooftop checkpoint flag, and then climb up to the top of the tower. From here, you should be able to jump over to the building's roof, using the umbrella there to jump up to the Power Moon. 12. Dizzying Heights: This Power Moon is at the very top (the very top) of the New Donk City Hall. Warp to the New Donk City Hall Rooftop checkpoint flag, drop down to use the electrical wire that will take you to the highest point they can reach on the building, and then climb higher with Mario until you reach the very top of the antenna sticking out of the top of the building. 13. Secret Girder Tunnel! : Starting at the Odyssey, walk towards the electrical pylon (on the red-coloured platform) that will take you to the main city but turn to the right instead when you get on there. You'll notice a little area of concrete that has an access for Mario to get inside the iron girders - head inside and grab the Power Moon waiting for you. 14. Who Piled Garbage on This? : At location 14 on our map, you'll find some rubbish bags on the roof - use Cappy to smash these and then ground pound the spot that is revealed to receive a Power Moon. The easiest way to access this area is to jump onto the taxi just in front of the Main Street Entrance flag, bouncing up to the roofs above and making your way over to the location on our map. 15. Hidden in the Scrap: After you've defeated the Mechawiggler boss, head over to the Mayor Pauline Commemorative Park checkpoint flag (the park in the far northeastern corner) and perform a ground pound on the piece of metal that has landed there to receive a Power Moon. 16. Left at the Café? : Warp to the Outdoor Café checkpoint flag and run all the way around to the back of the building. Take the electrical wire here (in the narrow alley that leads directly to the building's rear) up to the roof and use the HD Rumble in your controller(s) to feel a Power Moon under the floor. It is located in-line with the bush nearest the roof's railing. 17. Caught Hopping on a Building! : You'll find a rabbit hopping around on the roof at location 17 on our map. Head up there by flinging yourself from poles and make contact with it to receive a Power Moon. 18. How Do They Take Out the Trash? : Make your way to the top of the New Donk City Hall by warping over there and using the electrical wires to ride your way to the top. Look out from the northeast corner of the roof and you should spot a dumpster on top of a tall pillar. Jump and dive over to this pillar and break open the dumpster to reveal a Power Moon. 19. Metro Kingdom Timer Challenge 1: Head to location number 19 on our map to find a scarecrow on top of an iron platform. Throw Cappy at it and then jump across the see-saw platforms that appear to grab the Power Moon at the top. 20. Metro Kingdom Timer Challenge 2: Make your way to the top of the hall by warping over to the New Donk City Hall Rooftop checkpoint and using the electrical wires to ride your way to the top. Jump on the scooter there and ride onto the P-Switch. A checkerboard path will appear - drive onto and around this path, collecting the key at the halfway point, to make it to the Power Moon at the end. You'll need to do this in one smooth drive without stopping. 21. City Gardening: Building Planter: Head to the southeast corner of the park near the Main Street Entrance checkpoint and grab one of the seeds there. Now jump onto the taxi parked just behind the scooter to make your way onto the roof of the building there and throw your seed into the plant pot on this roof. Wait a while, and your seed will grow into a plant containing a Power Moon. 22. City Gardening: Plaza Planter: Head to the southeast corner of the park near the Main Street Entrance checkpoint and grab one of the seeds there. Now simply walk slightly north to find a plant pot in the corner of the park near where the guitarist was standing. Wait a while, and your seed will grow into a plant containing a Power Moon. 23. City Gardening: Rooftop Planter: Head to the southeast corner of the park near the Main Street Entrance checkpoint and grab one of the seeds there. Now run over to the slots building (just west of location 23 on our map) and head behind it (between it and the building north of it). Here you'll be able to wall jump to reach the roof, enabling you to throw the seed over to the plant pot on the roof of the building indicated by location 23. Wait a while, and your seed will grow into a plant containing a Power Moon. 24. How You Doin’, Captain Toad? : Head to the area where Mayor Pauline is standing (just in front of the New Donk City Hall and run around to the back of the building on the left hand side. On the right you'll see some boxes that can cleared away and, beyond them, an iron girder sticking far out into the sky. Right at the end of this girder is Captain Toad - talk to him to receive a Power Moon. 25. Free Parking: Rooftop Hop: For this Power Moon you'll need to get a scooter onto the roof of the building at location number 25. One easy way of doing this is to make your way to the top of the hall by warping over to the New Donk City Hall Rooftop checkpoint and using the electrical wires to ride your way to the top. Once there, jump onto the scooter, press the P-Switch, and ride around the track until you're lined up with the correct building. Ride off the track, flying down to the correct building and parking on the spot next to the man there. This may take a couple of attempts to get used to the direction in which you'll need to fly off the track. 26. Bench Friends: On the street at location 26 on our map, just around the corner from the Crazy Cap store, you'll find a man sitting on a bench. Jump onto the bench and leave the controller still for a while to allow Mario to sit down next to him. The man will give you a Power Moon for sitting with him. 27. Shopping in New Donk City: You can purchase this Moon from the Crazy Cap store for 100 gold coins. 28. Metro Kingdom Slots: Head to the slots building (location number 28 on our map) and play the game inside. Use Cappy to make each picture land on the Power Moon icon to win a Moon for yourself. 29. Jump-Rope Hero: In the park right next to the Main Street Entrance flag you'll find two women using a skipping rope (or jump rope). You'll need to time 30 jumps over this rope to get the Power Moon. 30. Jump-Rope Genius (see location 29): Is this the hardest Power Moon in Super Mario Odyssey? Possibly. In the same place as Power Moon 29, you'll need to make 100 successful jumps over the rope. To do so, you'll need an awful lot of patience and possibly some luck. 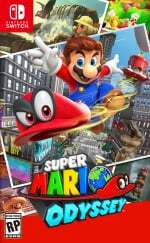 The best advice we can give to you is that as the rope starts to swing at its quickest (around 50 jumps in) you'll need to make sure you're pressing the jump button with as little pressure as possible, ensuring that Mario can make the quickest, shortest jumps available to him. 31. Remotely Captured Car: At location 31 on our map (opposite from the park with the jump rope) you'll find a man playing with an RC car. Capture the man to gain control of the car and make your way through the course to collect the Power Moon locked away inside the cage. 32. RC Car Pro! : Just behind the man playing with the RC car from Power Moon 31, you'll find an entrance to a building. Take on the RC car challenge inside to get this Power Moon. 33. Taking Notes: In the Private Room: Walk up the street to the east of location 33 on our map to see an entrance into the building. Inside you'll find a glowing treble clef - touch this, and then keep working your way around the room collecting all of the music notes that appear to get yourself the Power Moon. 34. City Hall Lost & Found: For this Moon you'll need to go inside the New Donk City Hall Interior. Enter the tower from the New Donk City Hall Rooftop checkpoint flag, and start making your way up inside. When you are near the top, you'll notice some black and yellow beams that Mario can shimmy up and down on. You need to find your way over the the beam on the far left of the room, use a wall jump to get yourself onto the beam above that, and then follow the next couple of beams above these to find a treasure chest containing the Power Moon. 35. Sewer Treasure: Enter the sewers at location 35 on our map and make your way to the end of this section until you arrive at the tricky spinning vertical platform. Instead of running all the way across this platform to the green pipe on the far side, you'll need to jump onto the platform, and then back upon yourself from its highest point to find a Power Moon on a ledge. 36. Celebrating in the Streets! : Head inside the auditorium at location 36 on our map and talk to the man standing near the stage to enter the 2D celebration section again. Make your way through the 2D platforming until you arrive at the place where you are upside down with barrels falling up from the floor. Jump onto the four ?-Blocks there (effectively now being underneath them) and jump again to uncover some hidden blocks. Jump on these to give you access to a green warp pipe - this will take you to a hidden room with a Power Moon inside. 37. 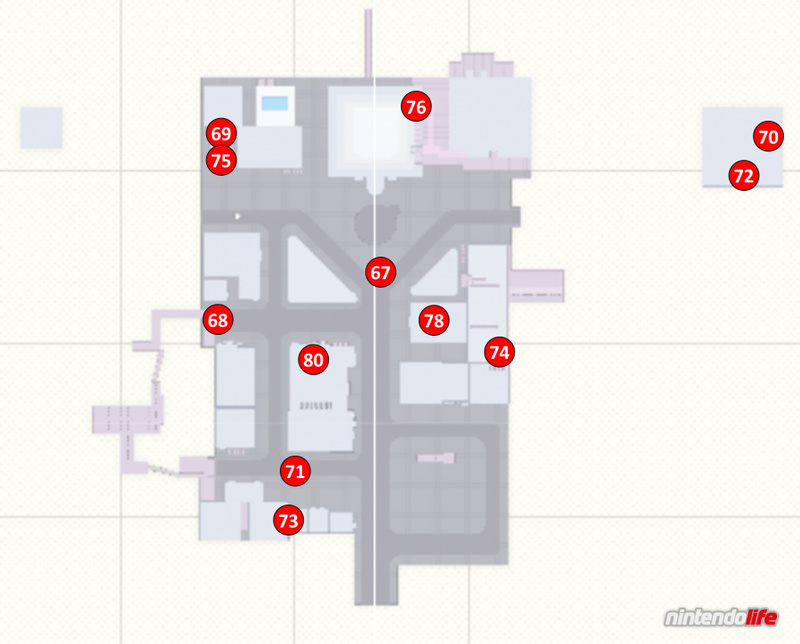 Pushing Through the Crowd: Head to location 37 on our map and go inside the building's entrance. Throw Cappy at the switch inside and then jump over the crowd of people to get this Power Moon. 38. High Over the Crowd (see location 37): Inside the same alley as Power Moon number 37, use the green New Donk City-branded awnings to bounce yourself up onto the metal platforms above. You'll need to swing across some poles to land on another metal platform containing a Power Moon. 39. Rewiring the Neighborhood: Head to the building at location 39 and make sure that you're wearing the Builder Helmet and Builder Outfit available from this Kingdom's Crazy Cap store. Talk to the man standing outside to gain access to the building and use the electrical wires to travel through the area inside. Eventually you'll find a section with five Moon Shards scattered around a square of wires. Avoid the Fuzzies and collect all of the shards to unlock the Power Moon. 40. Off the Beaten Wire (see location 39): In the same area as Power Moon number 39, keep an eye out for a wire that takes you over a building. Use 'ZL' to jump out of the wire and onto this building as you travel over it, jump down to the lower section of the roof, and smash the crates there to find a hidden Power Moon. 41. 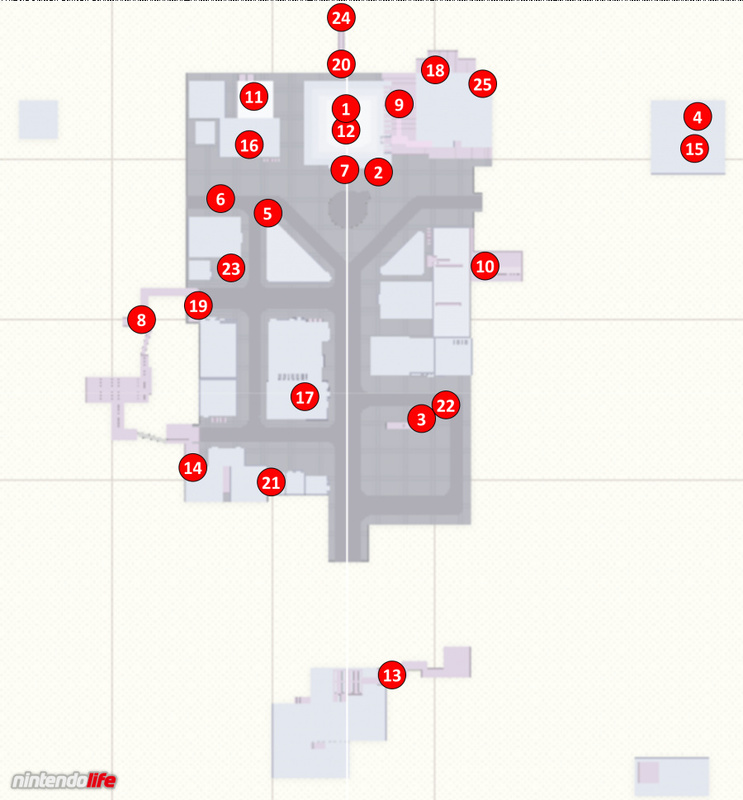 Moon Shards Under Siege: At location 41 on our map you'll find a taxi that can be captured. Throw Cappy at it and then try to drive it to see it whizz away. You'll find yourself in a dark, rainy version of New Donk City where you can use Sherm tanks to blast everything in sight. Wonderful! For this Power Moon, you'll need to use Sherm to uncover five Moon Shards. Blast everything that can be blasted (including the taxis) and run along every ramp and platform to find them all. 42. Sharpshooting Under Siege (see location 41): Inside the same area as Power Moon number 41, head to the end of the section on the left hand side and turn around. If you look up and to the left (to what is now the right hand side of where you started) you should spot some metal boxes on a roof far in the distance. Smash these with a Sherm to uncover a Power Moon. An invisible walkway to the Moon can be uncovered by throwing Cappy at the gap between the platform it is resting on and the one closest to it. 43. Inside the Rotating Maze: Head to location 43 on our map to find a manhole in the ground. Use Cappy to move it away and then jump inside to find a maze. Use Cappy again to rotate the yellow walls inside until you have found all five Moon Shards. You'll be rewarded with a Power Moon for completing the task. 44. Outside the Rotating Maze (see location 43): Inside the same room as Power Moon number 43, before you enter the maze, perform a backflip to get Mario on top of the glass. Run over to the opposite side of the maze and look down to find a hidden Power Moon and a trampoline flower which will send you back up to the glass. 45. Hanging from a High-Rise: Enter the alley from Power Moons number 37 and 38 and enter the green warp pipe sitting at the end. Capture the rocket here to travel to a new area and swing yourself across all of the poles here until you reach the Power Moon at the end. 46. Vaulting Up a High-Rise (see location 45): In the same area as Power Moon number 45, keep swinging across the poles until you come to the part where it is about to turn around to the opposite side of the building. You'll notice a pole that is going up and down - let it go up to the top and then wall jump from the wall behind you to reach a new pole. Climb up several more poles, using wall jumps along the way, until you eventually arrive at a hidden Power Moon. 47. Bullet Billding: Head to location 47 on our map (turning east from the main central road) to find a glowing entrance that will take you to a new area. Inside, use the beams and avoid the Bullet Bills to make your way to the end of the area and grab the Power Moon. 48. One Man’s Trash…(see location 47): In the same area as Power Moon number 47, capture a Bullet Bill at the top of the first building you need to climb. If you fly back the way you came you'll find a dumpster on a stray platform. Crash into this dumpster to reveal a hidden Power Moon. 49. Motor Scooter: Escape! 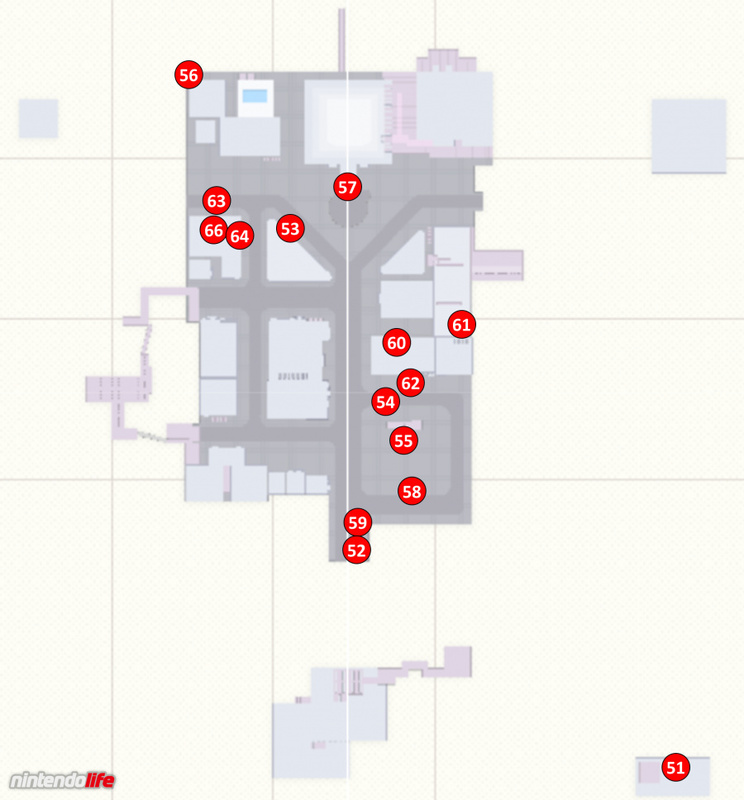 : Head to location 49 on our map to find an entrance to the triangular shaped building. You'll find yourself in an alley of sorts with a scooter in front of you. Jump onto this scooter and drive towards the camera to start an epic chase. This first Power Moon of this area will be on the left side of the screen on top of a pile of crates. 50. Big Jump: Escape! (see location 49): In the same chase sequence as Power Moon number 49, you simply need to make it to the end, swerving your scooter harshly from side to side to dodge attacks when necessary to find the Power Moon waiting for you. 51. Secret Path to New Donk City! : For this Power Moon, you'll need to enter a warp painting inside the Sand Kingdom to find yourself in a distant area within the Metro Kingdom. Fly to the Sand Kingdom and find a tall pillar just north west of the poison lake on the eastern side of the Kingdom. You'll find a painting attached to one side of this pillar which will warp you back to this Power Moon in the Metro Kingdom. 52. A Tourist in the Metro Kingdom! : To receive this Power Moon, you'll first need to talk to the Tostarenan in the Sand Kingdom who wants a taxi ride. When you've done this, and have returned to the Metro Kingdom, you'll see that he has now arrived in New Donk City just after the initial electrical wire that takes you onto the mainland. Talk to him here to receive a Power Moon. 53. Found with Metro Kingdom Art: The hint art for this Power Moon is high up on the side of the triangular building, just below where the trumpeter was standing early on. You'll need to head to the Water Plaza of the Lake Kingdom and ground pound the tile as indicated in the artwork (near the Lochlady standing next to the shaft of water that goes up to the roof). 54. Bird Traveling in the City: There is a glowing bird flying around the city and, if you can make contact with it, you'll receive a Power Moon. Its flight path is hard to follow and it often changes altitude, but one of the best places to grab it is at the park near the entrance of the Kingdom (we managed to grab it at location 54 on our map). Our advice would be to perch yourself on the roof a nearby building, watching out for the bird and jumping down to it when it flies closeby (throwing Cappy at it if necessary). 55. Mario Signs His Name: Use Cappy to capture and move the unmissable letters in the park at the southeast of the city. Simply spell 'Mario' to be rewarded with a Power Moon. 56. Surprise Clown! : For this Power Moon you'll need the complete Clown outfit which is available from the gold coin half of Crazy Cap stores (you can check out our outfit guide if you need help with this). Whilst dressed as a clown, head to location 56 on our map. At ground level, tucked away in the corner, is a man who wants to see a clown. Talk to him as a clown to receive a Power Moon. 57. A Request from the Mayor: After completing the main plot points in the Kingdom, return to Mayor Pauline to find out that it's her birthday. She'll ask you a series of questions about herself - answer these until she tells you that she loves presents. Now, warp to the Heliport checkpoint flag and jump down to the west to find a handbag surrounded by some spinning coins. Take this handbag to Mayor Pauline and she'll give you a Power Moon in return. 58. Jammin’ in the Metro Kingdom: Head to location 58 on our map to find a Toad wearing some headphones. He'll ask you to play a specific track and will give you a Power Moon if you play the right one. You'll need to play the song 'RC Car' which is number 80 on the list of songs. If you don't have this track, make sure to get Power Moons 31 and 32 first to unlock it. 59. Sphynx in the City: Capture the binoculars near the Main Street Entrance checkpoint flag. Look up to the sky to find lots of taxis flying through the air - one of these will actually be a Sphynx. Zoom in on the Sphynx for several seconds to be rewarded with a Power Moon. 60. Free Parking: Leap of Faith: At location 60 on our map, a man is standing next to a place to park a scooter. If you can get a scooter to this point, you'll receive a Power Moon. To do this, head to the top of the New Donk City Hall, using electrical wires to zoom up. When you are at the level with a scooter, jump on and ride onto the P-Switch nearby. Now drive around the checkerboard track until you make it all the way around and are heading in a southerly direction (you can check this with your compass). When you are heading south (and therefore in the direction of the building with the man on) fly straight off and aim to land on any of the buildings near the one you're aiming for. Then simply travel across to the place where you need to park the scooter. This may take several attempts, but you'll start to learn where you need to land. 61. Metro Kingdom Regular Cup: Head to location 61 to find a Koopa who will challenge you to a race. The key to victory (and therefore the Power Moon) is to use a shortcut. From your starting position, jump onto the metal directly in front of you, and then to the left to find a pole on the building. Use the pole to fling yourself upwards, then run all the way along this building and use a long jump and Cappy dive at the end to make it to the next building across. From there, run along and use the pole to fling yourself over to the building directly across from you, taking out a sizeable chunk of the route that the Koopas take. 62. Hat-and-Seek: In the City: One of the men walking around the city is wearing a hat that is actually one of the Cap Kingdom residents. We found him walking at location 62 on our map - simply talk to the hat to receive a Power Moon. 63. Powering Up the Power Plant: Use Cappy to remove the manhole cover at location 63 on our map and jump inside. After you've travelled through the green warp pipe inside, you'll find a new puzzle that wasn't there the first time you came through this section. Use Cappy to control the block and fit it into place to receive a Power Moon. 64. Up on the Big Screen: Head to the eastern side of the building indicated by the number 64 on our map to enter a theatre. Play through the 2D section inside and collect all five Moon Shards to get a Power Moon. 65. Down Inside the Big Screen (see location 64): Inside the same 2D section as Power Moon number 64, enter the fourth green pipe to find a secret area below with a second Power Moon available. 66. Peach in the Metro Kingdom: Climb to the top of the building indicated by the number 66 on our map to find Princess Peach standing there. Talk to her to receive a Power Moon. 67. Hanging Between Buildings: Make your way to the top of the smaller triangular building (just east of location 67 on our map) to find a large red button. Ground pound this button and run along the checkerboard path it creates to collect the Power Moon hovering there. 68. Crossing Lines: Warp to the Rooftop Garden checkpoint flag and ride the wire to the buildings to the north of you. Halfway along this wire you'll notice three coins leading up to a Power Moon - keep pressing the 'Y' button to ride through the coins and up to the Power Moon. 69. Out of a Crate in the City: Warp to the Outdoor Café checkpoint flag and use wall jumps between the buildings nearby to get to the roof. You'll find a glowing crate on the roof here - smash it to reveal a Power Moon that sits itself above a nearby sign. 70. Bird Traveling in the Park: Warp over to the Mayor Pauline Commemorative Park checkpoint flag in the far east and look out for a glowing bird circling the park. Throw Cappy at this bird to reveal a Power Moon. 71. Metro Kingdom Timer Challenge 3: You'll find a scarecrow standing next to the RC car track near the entrance of the city. Throw Cappy at the scarecrow and make sure to use lots of long jumps to travel quickly and collect the Power Moon before it disappears. 72. Found in the Park! Good Dog! : Warp over to the Mayor Pauline Commemorative Park checkpoint flag and play with the dog there. After a good while, it'll eventually dig up a glowing spot containing a Power Moon. Just stay with it and be patient. 73. RC Car Champ! : Re-enter the building from Power Moon number 32 to find another time trial opportunity. You'll need to race through three laps in 26 seconds - our best advice here is to keep your foot on the pedal (or finger on the button) at all times and stick to the middle of track, ensuring you don't hit the sides. 74. Metro Kingdom Master Cup: Head to location 74 to enter a second race with the Koopa group. As before, making use of a big shortcut is key here. From your starting position, jump onto the metal directly in front of you, and then to the left to find a pole on the building. Use the pole to fling yourself upwards, then run all the way along this building and use a long jump and Cappy dive at the end to make it to the next building across. From there, run along and use the pole to fling yourself over to the building directly across from you, taking out a sizeable chunk of the route that the Koopas take. 75. Hat-and-Seek: In the Crowd: Inside the same alley as Power Moon number 37, stand in a position so that you can the backs of all of the people. One of them will be wearing a hat that is actually a resident from the Cap Kingdom. Wait until you see it, and then talk to the hat to receive a Power Moon. 76. Scaling Pitchblack Mountain: Head to location 76 on our map (accessed by warping to the Heliport checkpoint flag and falling down between the two buildings) and enter the grey warp pipe. Inside, you'll need to use the Stairface Ogres' mallets to climb up onto higher levels of the tower. When you reach the top you'll find a Power Moon. 77. Reaching Pitchblack Island (see location 76): Inside the same area as Power Moon number 76, run around to the rear of the first level and throw Cappy to the north to reveal an invisible pathway. Cross the pathway to the platform ahead and perform a ground pound there to reveal a Power Moon. 78. Swinging Scaffolding: Jump! 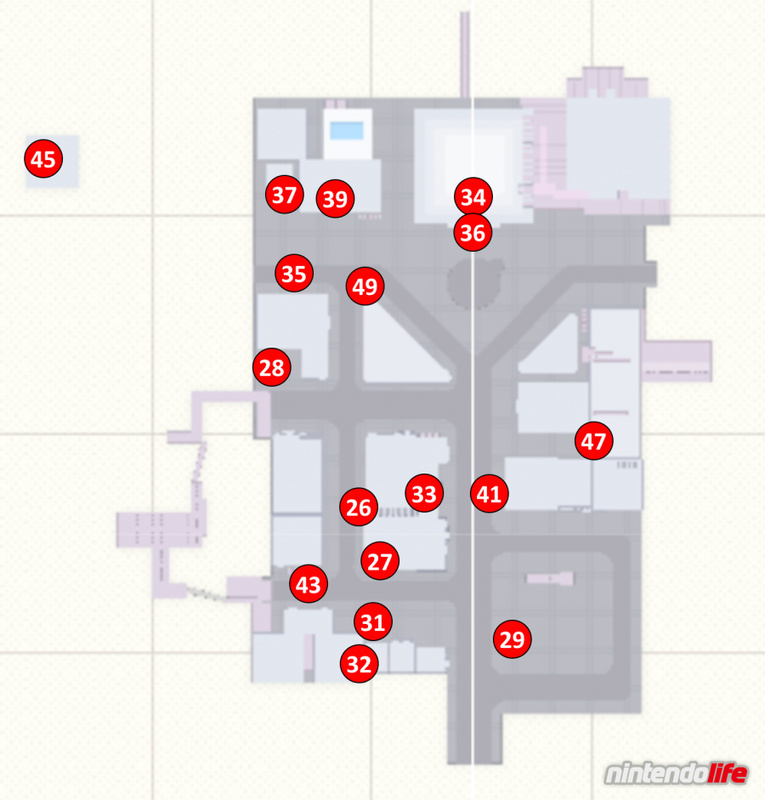 : On the rooftop of the building indicated by the number 78 on our map, you'll find a grey warp pipe. Enter this pipe and make your way to the end of the section to receive a Power Moon. Using Mario to run across intricate areas is easiest, with Hammer Bros being good for jumping high. 79. Swinging Scaffolding: Break! (see location 78): Inside the same area as Power Moon number 78, keep an eye out on the left hand side for a small pile of rock. Capture one of the Hammer Bros nearby and make your way over to it, using their ability to smash the rock and reveal a Power Moon. 80. Motor Scooter Daredevil! : Warp to the Rooftop Garden checkpoint flag and jump over to the shorter building to the northeast to find a grey warp pipe. Inside you'll find three sections that must be traversed on a scooter. For each section, ride onto the P-Switch and ride like the wind - when you make it to the end you'll find a Power Moon. 81. Full-Throttle Scooting! (see location 80): Inside the same area as Power Moon number 80, make your way through until you make it to the third P-Switch. In this section, a separate trail leads off to the right hand side - over some orange-coloured breakable floor. You'll need to jump across this section (keeping your acceleration up at all times) to find a Power Moon at the end. We hope that you have found this guide on collecting all Power Moons in Super Mario Odyssey's Metro Kingdom useful. Let us know if you've managed to grab them all with a comment below. For those who are ripping out hair over the jump rope challenge, use the scooter. That's how I did it! The jumps are far easier to control. When i got my Switch, i will make Mario wears Samurai outfit, walking around New Donk City, make a Parody of Super Samurai by Junko Karashima, a DDR Song. I'm Samurai comin' to NYC. These guides have been so helpful, but I’ll probably only check this one if really stuck. The kingdom is such a joy to explore. To properly do the jump rope. Don't stand in the center. Stand a bit to the side where the rope is going UP. It give you much more time to jump. @AhabSpampurse Seriously? I have not even thought about trying that but will give it a go when I get home. I'm able to get as high as 64 using no tricks but I'm ready to give up! @dkxcalibur absolutely. The hardest part is getting the bike into the jumping position. Once you're in though the small jumps required for the end stretch are hella easy with the scooter.